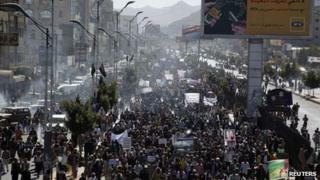 Thousands of Yemenis have taken to the streets of Sanaa, to protest against the killing of demonstrators and demand their country's acting leader resign. As they marched past the office of Vice-President Abdrabbuh Mansour Hadi, the protesters called him a "tool" of outgoing President Ali Abdullah Saleh. Mr Hadi earlier called for calm, a day after nine protesters in Taiz were killed by forces loyal to Mr Saleh. They had been demanding that Mr Saleh's immunity from prosecution be revoked. Hours after Saturday's violence, the president said he would leave for the US to "calm the atmosphere for the unity government to hold the presidential election" in February. But he gave no timetable for leaving and promised to return in opposition. Mr Saleh handed over power to Mr Hadi last month after signing a Gulf Co-operation Council-brokered agreement that gave him immunity. The deal sought to end a year of violence that has seen hundreds of protesters killed by security forces and Mr Saleh's supporters, and deadly clashes between them and pro-opposition tribal forces. On Sunday, the state news agency, Saba, quoted Mr Hadi as telling US ambassador Gerald Feierstein that all sides had to "commit... to a truce and respect [the GCC agreement's] rules forbidding escalation". Activists accused military units led by Mr Saleh's son Ahmed of being behind Saturday's violence. They also said dozens of people were arrested by the National Security police led by Mr Saleh's nephew. "The situation will not stabilise, since Saleh's relatives and supporters are still holding sensitive positions in the army and government," said Fathi al-Rawdi, one activist at Sunday's protest told the Associated Press.